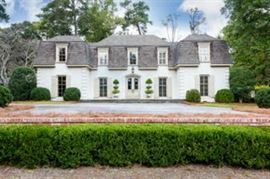 Beanie People Go With the Flow on Garraux, in the HEART of Buckhead! 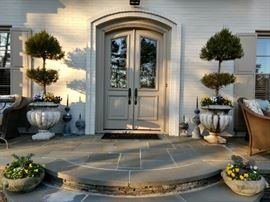 Front entry, with vintage zinc lightning rods, pair of concrete planters, with lion heads and pansies. 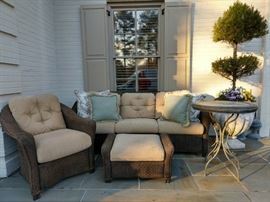 Very comfy grouping of outdoor rattan furniture, by Lloyd Looms. Another grouping of all-weather wicker, by Lloyd Looms furniture, with Smith & Hawken teak coffee table. 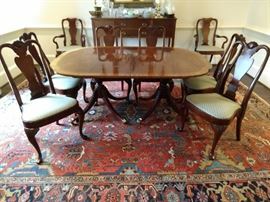 Nicely appointed dining room, with Baker (Historic Charleston Collection) dining room table (2 leaves) with eight chairs. 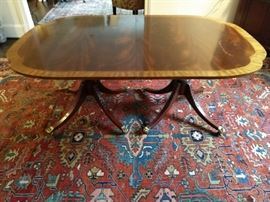 Extremely high end Baker Historic Charleston Collection Mahogany Dining Table in the Duncan Phyfe Style featuring a table top with wide satinwood band and scalloped shaped edges sitting on top of two intricately carved acanthus leaves on the urn shaped bases with four saber legs that curve outward terminating in brass paw feet on casters. Table comes with 2 leaves. Measurements: 29" H X 46" D x 70" W unopened. Each leaf is 16.5". Table opens to 103". 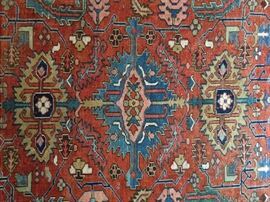 GORGEOUS antique Persian Serapi, measures 9' 11" x 12' 10". 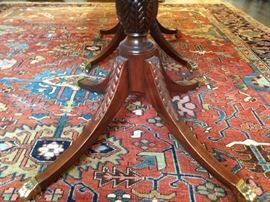 This is a pic of the center medallion of the Persian Serapi rug. 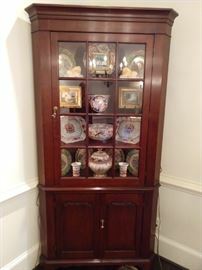 7' 2" T x 3.6' W lighted mahogany china cabinet. Top view of the Sheridan style buffet. Vintage hand woven Persian Heriz runner, measures 12' 5" x 3' 2". View from the front door, to the left, looking into the dining room. 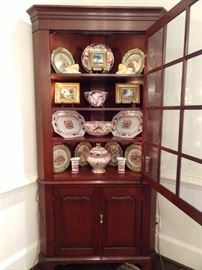 Lovely flame mahogany 4-drawer chest, one of a pair of blue/white porcelain table lamps, one of a pair of lovely, vintage mahogany & gilt wood mirrors, with golden eagles. Handsome 4-drawer flame mahogany chest, by Ethan Allen. Beautifully appointed queen size bed, with custom linen fabrics, with SealyPosturepedic Preferred Series Plush Pillowtop mattress. 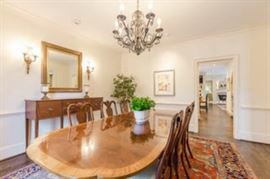 Pair of Baker drop-leaf mahogany Pembroke tables, with pencil inlay and cascading bellflowers and pair of Asian porcelain table lamps. You can see three of the set of seven NY Botanical Garden prints. Another of the four bedrooms in this house. 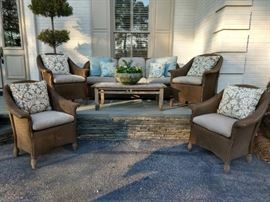 Wonderful pair of silk upholstered slipper chairs, with down cushions, by Cameron Collection, Dallas. One the wall, four of seven nicely framed 19" x 23" botanical prints, by The New York Botanical Garden. 7-drawer mahogany chest, by American Drew Furniture Co.
One of the four bedrooms in this house. Queen size bed with rarely used Sealy Posturepedic mattresses, pair of Pembroke side tables with satin inlay and cascading bellflowers, vintage Lane cedar chest. 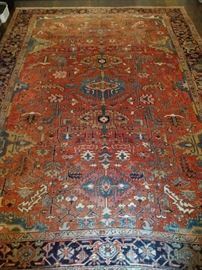 Stunning vintage all-over pattern Persian Heriz rug, measures 13' 5" x 10' 8". Antique English mahogany 5-drawer chest, with pencil inlay, pair of wooden candlestick lamps and 5' tall antique French gilt mirror. Close-up of the antique mahogany English chest. Vintage cherry 6-drawer chest, by Stickley. Vintage hand woven Persian Mahal runner, measures 9' 5" x 3' 7". View of the master bedroom screened porch. Yummy oxblood leather sofa, with aged bronze nail heads, by Hancock & Moore. We've all seen that flaky leather crap that cheap retailers promote on sale - this is the real deal! Handsome French Farm table with set/8 vintage wood/cane dining chairs (2 arms, 6 sides). Yet another gorgeous vintage Persian Heriz rug, hand woven, measures 8' x 10' 4". Stately wooden armoire, flanked by a pair of leather/cane armchairs, by "Our House Designs". Pristine white couch, by Hickory Chair. Antique, artist signed oil painting, pair of hand painted blue opaline glass Continental urns, pair of vintage brass/crystal candlesticks.